CHICAGO, IL—A new report finds that a broadly available screening tool accurately predicts continued housing instability among young people experiencing homelessness, and that housing programs for youth—when they are available–are associated with positive outcomes for at least a year. Toward a System Response to Ending Youth Homelessness, a report by Chapin Hall at the University of Chicago, in collaboration with the University of Southern California and Youth Collaboratory, focuses on components of effective, coordinated crisis-response systems for youth experiencing homelessness. Researchers found that the Next Step Tool for homeless youth–the most widely used risk assessment tool for youth coming into homelessness systems in the U.S.—accurately predicted housing instability among young people. Those with the highest scores were the most likely to remain homeless or become homeless again. 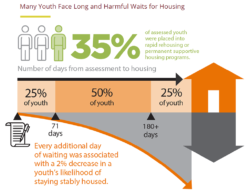 At the same time, even many youth with low risk scores remained homeless without supports, and the longer youth had to wait for housing placements, the less likely they were to remain stably housed. In this study, researchers analyzed the largest national data set combining risk assessments with homelessness systems data on youth. Local homelessness systems across 16 communities from 10 states collected data as part of their intake and monitoring process. The communities include urban, suburban and rural areas. Another study finding was that youth who had access to two types of programs — rapid rehousing and permanent supportive housing – remained stably housed a year after that intervention. Overall, though, youth had to wait far too long, and at great risk, for access to these programs. The average wait time from assessment to housing was more than four months. The longer youth had to wait for services, the more likely they were to return to homelessness. The study also found that African American and Hispanic youth were over represented in the homelessness system, had to wait longer for placements, and were less likely to successfully return to their families. This report was funded by the Schultz Family Foundation. Chapin Hall is an independent policy research center at the University of Chicago focused on providing public and private decision-makers with rigorous data analysis and achievable solutions to support them in improving the lives of children, families and communities. Chapin Hall partners with policymakers, practitioners, and philanthropists at the forefront of research and policy development by applying a unique blend of scientific research, real-world experience, and policy expertise to construct actionable information, practical tools, and, ultimately, positive change for children, youth, and families. Youth Collaboratory harnesses the power of the youth services community to innovate, evaluate, and drive effective strategies that ensure the safety and well-being of youth and young adults, unlocking their limitless potential. As a national network, Youth Collaboratory has a broad reach – annually connecting with over 12,000 providers, funders, and researchers, and providing training or supports to 3,000 of those stakeholders. We attract the innovators in the field and have over 200 members across 46 states serving youth and young adults at highest risk for victimization and/or delinquency. Youth Collaboratory was formally known as MANY.